Page 26: rising to the recent Fastener Poland and the growing investments on this area, an interesting focus about Dimac partnerships with the main fastener and fixing OEMS in Poland, that are more and more successful, especially on the automotive industry, as companies guaranteeing 100% quality. Page 40: The innovation DNA is at Fastener Fair France 2018. Read the preview about Dimac news on New Technologies applied to the 100% inspection & sorting. 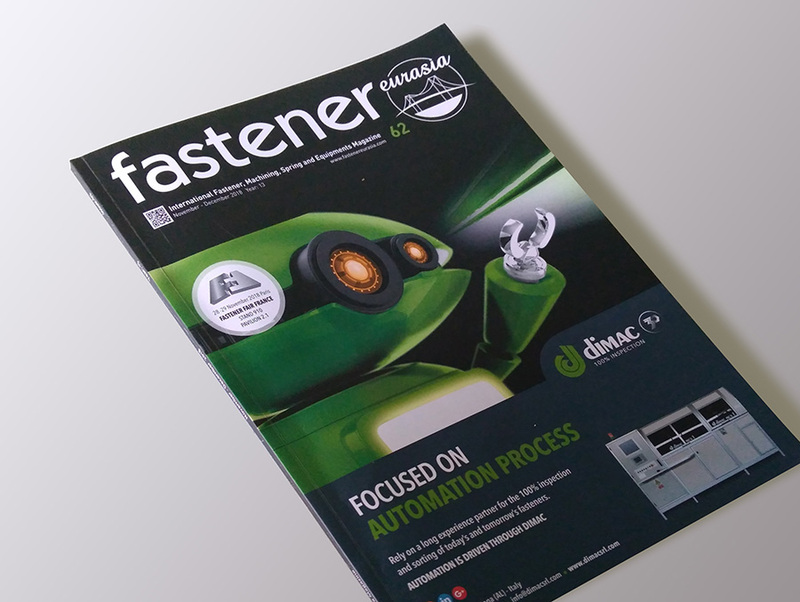 Page 80: Discover the X factor making Dimac technology one of the most advanced to support the worldwide fastener manufacturers committed to the Zero-Defect target. Page 90: Fastener Fair France 2018. The 4.0 novelties Dimac will exhibit during the Expo. Page 124: The 100% inspection & sorting importance for the fastener and fixing segment, the added-value of Dimac machines, the market demand evolution, the innovation as a must and the future challenges. All that is on the insight published on the “Manufacturing Technology” column. Read the interview with GM Massimo Agrati.